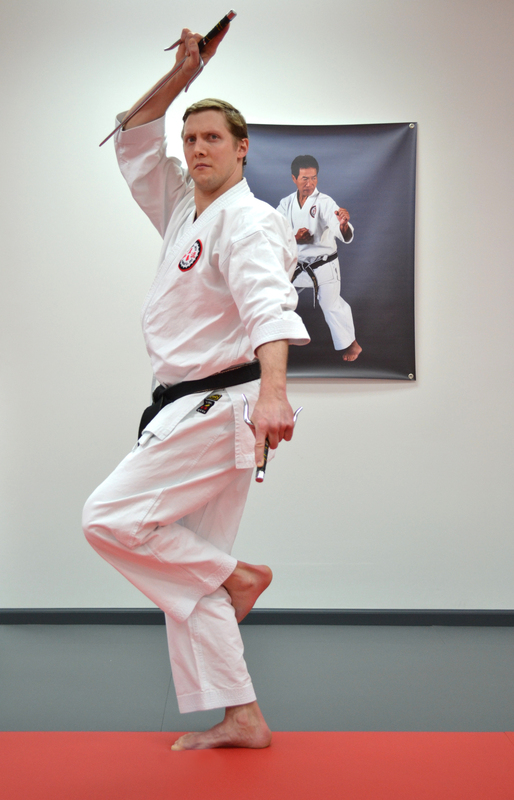 William Max Winkler is a fifth degree black belt and the Chief Instructor at Hidy Ochiai Karate – Northern Virginia. Sensei Winkler has had a life-long love of the martial arts, but it wasn’t until he met Master Hidy Ochiai in 2000 that he found the martial art he would dedicate his life to learning and to teaching. Upon graduating Cornell University in 2003 with a B.A. in Religious Studies and a concentration in Asian Studies, Sensei Winkler moved to Binghamton, NY to train with Master Ochiai full-time at his National Headquarters, beginning an apprenticeship that would last 9 years. In that time, Sensei Winkler has had numerous achievements in martial arts competition, and he has held many teaching positions leading up to the opening of Hidy Ochiai Karate – Northern Virginia in 2014. William Max Winkler has won the Wa-shin Ryu National Invitational Tournament Black Belt Kumite (sparring) division seven times (2008-2012, 2015-2016). He is also a three-time Black Belt Kata champion at the Wa-shin Ryu National Invitational Tournament (2010, 2012, 2015). In 2010, Sensei Winkler finished in the Final Four for Black Belt Kumite at the Ozawa Cup, an international tournament held in Las Vegas, Nevada with over 800 competitors worldwide. And, at the 40th Annual Pennsylvania Karate Championships in 2012, Sensei Winkler placed first in the Black Belt Kata division and finished second overall in kata for the state of Pennsylvania. William Max Winkler holds the teaching rank of Joh-i Shido-in (High-Rank Instructor), which is the highest teaching rank available to Wa-shin Ryu instructors, and he holds the title of Shibu-cho (Branch Instructor). See Sensei Winkler on the Wa-shin Ryu Certified Instructor webpage. Sensei Winkler started teaching in 2003 at Hidy Ochiai Karate of Ithaca, where he was an Assistant Instructor until 2005. In 2006, he co-instructed at Hidy Ochiai Karate of Cortland, and in 2008 Sensei Winkler became the Chief Instructor of Hidy Ochiai Karate of New York City, located in the heart of downtown Manhattan. He held this position until the summer of 2012, when he moved to Northern Virginia. In addition, Sensei Winkler taught three martial arts courses as an Adjunct at the University of Binghamton from 2008-2012. He was nominated by the senior class of 2009 as having one of the “must attend” classes before graduation. Aside from competing and instructing in the traditional martial arts setting, Sensei Winkler is a Head Trainer for the Educational Karate Program (EKP), which he has been intimately involved with since 2002. EKP is a non-profit organization founded by Master Ochiai that the New York State Education Department validated in 1995, which sanctioned EKP to be included in the curriculum of all NYS public schools. EKP teaches students of all ages how to improve themselves both mentally and physically, while learning the principles of respect, confidence, anti-violence, and anti-substance abuse. Sensei Winkler has trained hundreds of physical education teachers in the EKP curriculum. He has also directly taught at-risk youth as an Instructor for Upward Bound EKP at Binghamton University and Gear Up EKP at Binghamton High School, as well as instructing numerous after-school EKP classes to parents and children in the Ithaca City School District. From 2006-2007, Sensei Winkler taught EKP as a PE Instructor for Ross Corners Christian Academy and Hillel Academy. William Max Winkler is excited to share all the knowledge he has accumulated over the years with the Northern Virginia community. His mission is to provide each student with the same authentic martial arts education that he first received in 2000, so that every one that walks through his doors can experience for themselves the countless benefits of the traditional martial arts.